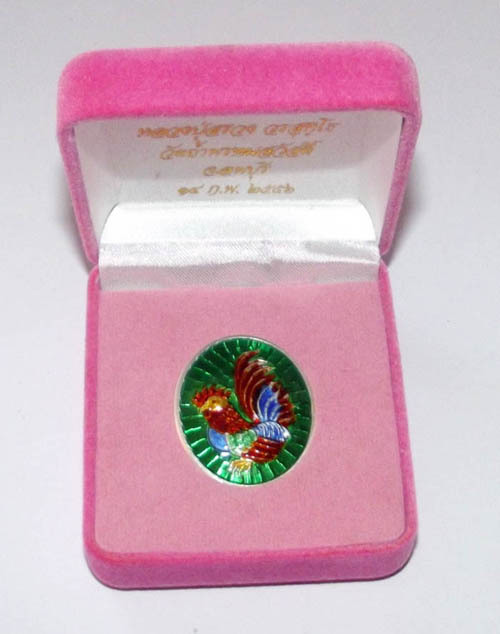 Luang Por Suang’s cockerel amulets have become not only legendary and a tradition of his amulet making wicha, it is also traditional and meritorious of Luang Por Suang, that he uses his editions of amulets to help other temples in need. In the case of this third edition, which is a fundraiser to raise funds for the building of a Sala Brian (a building for study) at Wat Tham Prohm Sawad. The building is for Buddhist monks to study the Dhamma, and the suttas of the Buddhist canon. 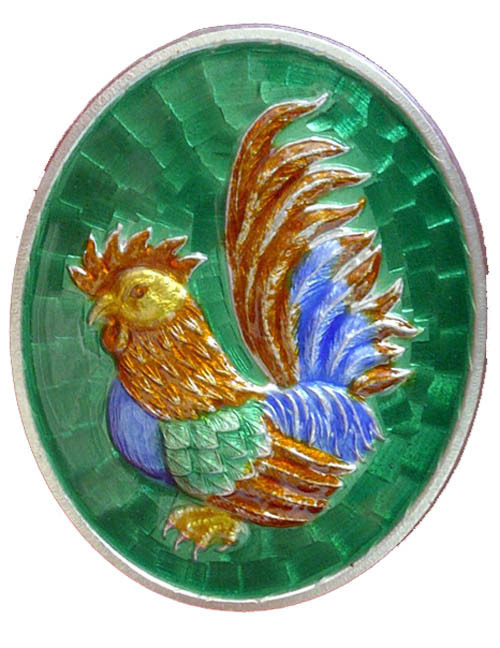 The making of amulets in the image of a cockerel is rare in Thai Buddha magic, but has been seen by some of Thailand’s great masters of the past to have been for those few a preferred form of sorcery. 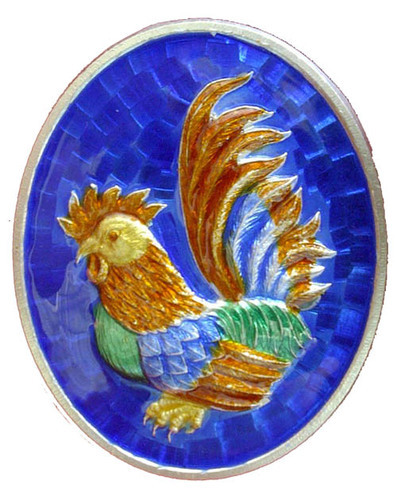 Indeed, the cockerel represents the first of the five self enlightened Buddhas of this universe’s lifespan (‘Pra Kakusanto’ or ‘Kakusanta Buddha’). One famous master, whose amulet of a Buddha sitting on top of a cockerel, was of course the great Luang Por Parn of Wat Bang Nom Kho in Ayuttaya, and his looksit ‘Luang Por Ruesi Ling Dam’. 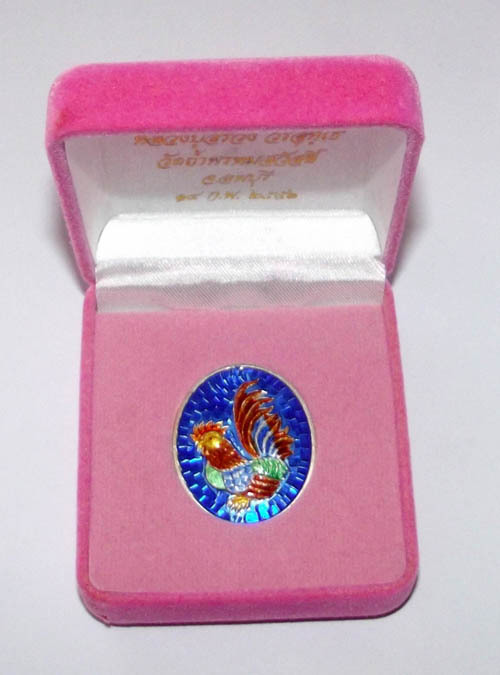 Luang Por Suang has created this edition of special coin amulets in sacred solid silver with a luxurious glaze of ‘Ya Rachawadee’ enamels to decorate the surface of the solid silver coins with color and a lustre of luminosity, which only the authentic Ya Rachawadee can bring to the surface of sacred metal coin amulets. The rear face of the amulets have sacred yantra and Khom Agkhara spell inscriptions embossed, and the name of Luang Por Suang Worasutto and his temple, Wat Tham Prohm Sawad. The amulets were made in ‘pim yai’ (large size) and ‘pim lek’ (small size), in two different colored enamels, namely blue and green. 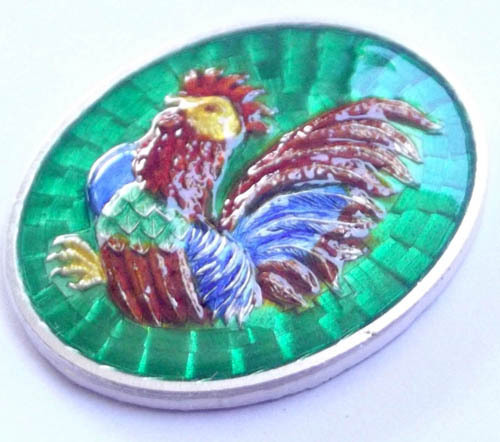 The coins were made in solid silver, as well as in alpaca and sacred brass with an enamelled image. The alpaca and brass versions had no back surface enamels behind the cockerel though, which is only applied to the ongk kroo models. They were also released in plain sacred metals without enamels. It is notable for students of the collectorship scene, that only the ongk kroo models of this edition have taken on fanaticism and become highly praised collector coins, whereas the other models are still relatively easy to find in circulation. We believe, however, that sacred is sacred, and that collectorship and speculation of collector class amulets is not related to sacred value or miracle power. An ongk kroo or a standard versions would in principle, like metallic coins without sacred herbs or magical ingredients, have the same power. This rule, of course, does not apply to sacred powder amulets, oils, or necromancy, where the ingredients used are sometimes different with different price models and also have different levels of power. But in the case of sacred Buddhist coin amulets, most of the miracle power comes from faith and the purity of the monk who blesses them, more than in the metal used to make them. The amulet comes in original felt box from the temple. But can also be encased, if wished to be worn. Still, the ongk kroo models are apart from sacred, also a long term worthwile investment, which will increase in both sacred, monetary and collector scene value, as well as providing the essential blessings and magical aid to the devotee. 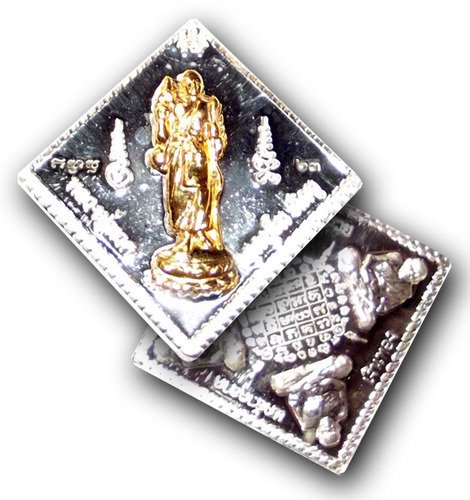 Maha lap, maha pokasap, metta mahaniyom, kaa khaay; this amulet possesses all of the aforesaid blessings, for wealth increase, happy social and professional environments, great treasures, gifts and successful profession. It is also great mercy charm for business and social seduction. 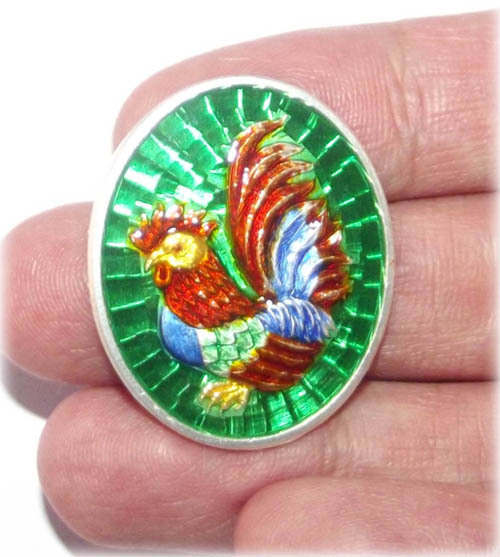 As in the past Luang Por Parn and LP Ruesi Ling Dam were the masters of celestial cockerel (‘Gai Fa’) amulets, in the present era it is Luang Por Suang who is second to none in this wicha. Luang Por Suang has inherited the wicha from some of history’s great masters, such as Luang Por Khom of Wat Phai Rong Wua, Luang Por Khaeg of Wat Huay Khao (Supann Buri Masters), and learned mastery of Kammathana (mastery of Kammathana is almost a prerequisite to psychic power) with some of the masters of the time, like Luang Phu Khaw Analayo, Luang Phu Kam Dee, Luang Por Der, Luang Phu Taes Taep Rangsri, Luang Phu Chorp, and the great Luang Phu Fan Ajaro. 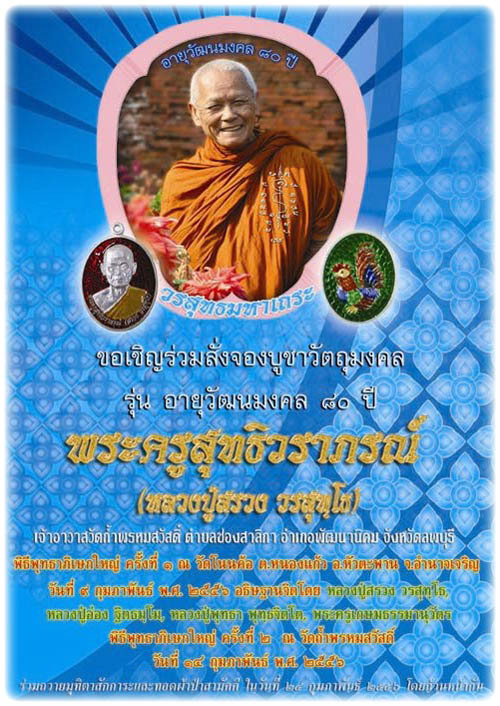 Puttapisek, or ‘Buddha Abhiseka’ empowerment and blessings ceremony was performed at Wat Tham Prohm Sawad in Lopburi on the 14th of February 2556 BE at 13.09 PM. 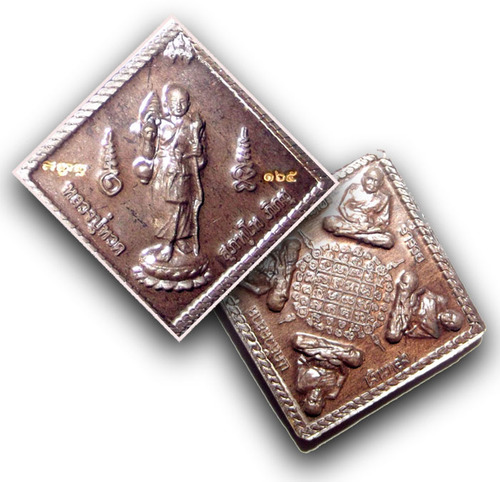 Top of the range rian amulet of the Sompochana edition Luang Por Tuad monk coins. The ongk kroo top model in this series features a solid silver coin with a 24 karat solid gold image of Luang Por Tuad. The other models were made in various sacred metals, like solid silver, sacred copper, brass and alpaca silver, nava loha, and nava loha with a solid silver image of Luang Por Tuad. 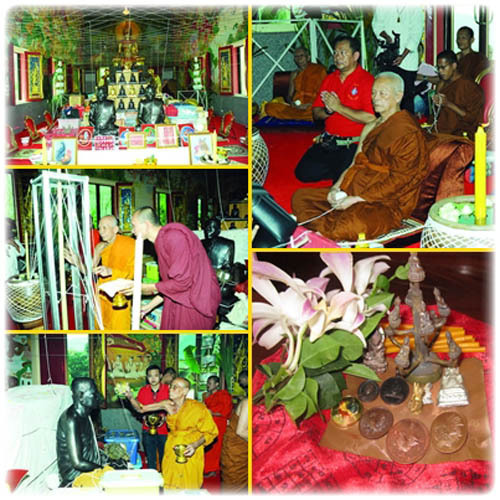 The coins bear the image and the invocation of Pra Luang Por Tuad of Wat Chang Hai and Wat Pako. 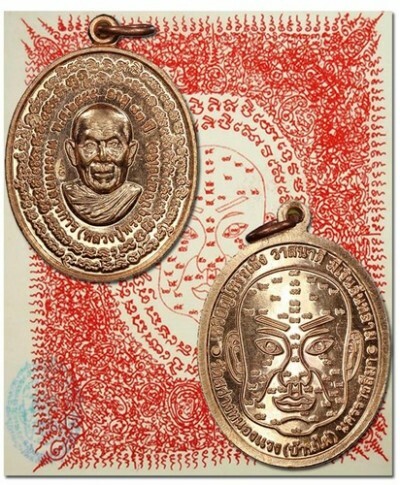 The metal coin amulets were released in 2556 BE at the temple of the world’s tallest standing Luang Por Tuad statue, Wat Mae Takrai in Chiang Mai Province. The amulets from this edition are, of course, an essential acquisition for any devotee of Luang Por Tuad, and indeed, for any serious collector of Luang Por Tuad amulets. But, of course, those who seek protection and auspicious blessings of lucky fortunes and wealthy professions, may benefit from these sacred amulets as well. The front face features an image of Luang Por Tuad standing with the a typical tudong forest wandering umbrella, called a ‘glod’. The image is a replication of that of the world’s famous statue at Wat Mae Takrai. 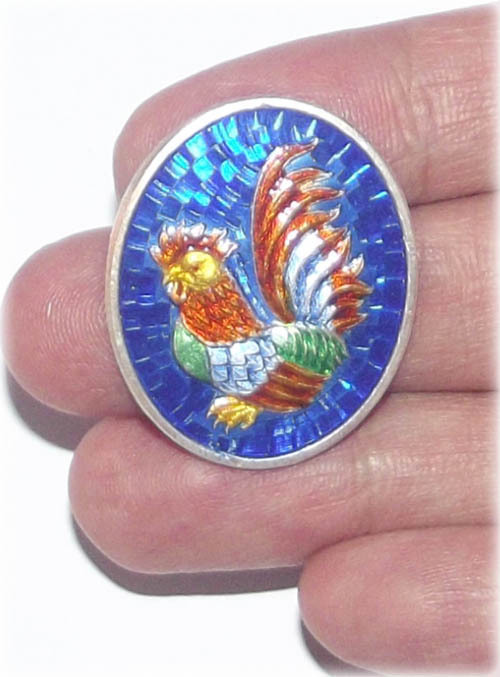 The amulet is very apt for ladies and children, as well as men due to its small size. It has a remarkably powerful aura that makes it a completely unisex amulet for both men, women and children to wear. Furthermore, it contains purely auspicious Buddha magic with anti black magic power. This, of course, makes the amulet especially useful for one’s children, as a protection against the asura, yaksa, djinn, demons and ghostly beings, who love to victimize children by entering their bodies and becoming viruses which will make them ill. 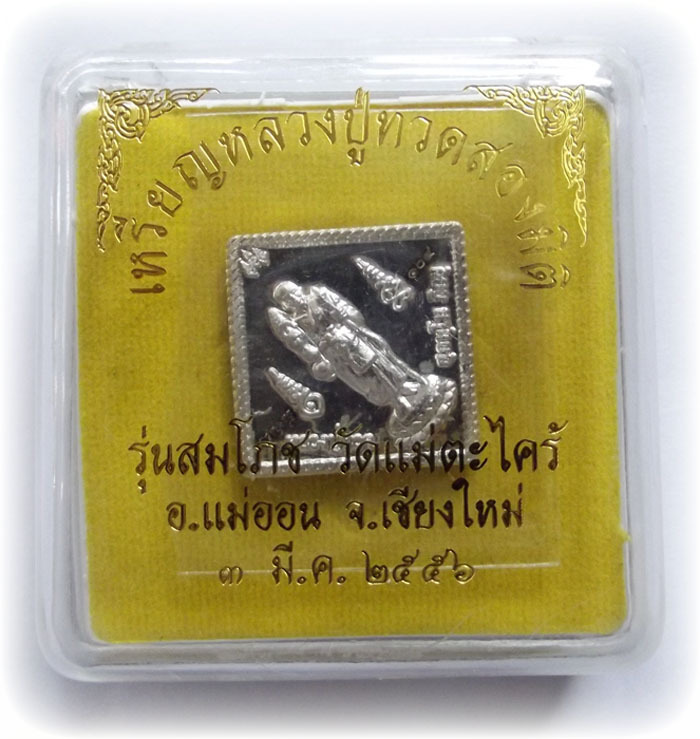 The rear face of amulet has four blessings written around the edges, namely: (1) plord pay (safe and sound); (2) klaew klaad (invincible to deadly accidents); (3) ram ruay (rich as a millionaire); and (4) ngern tong (gold and silver). 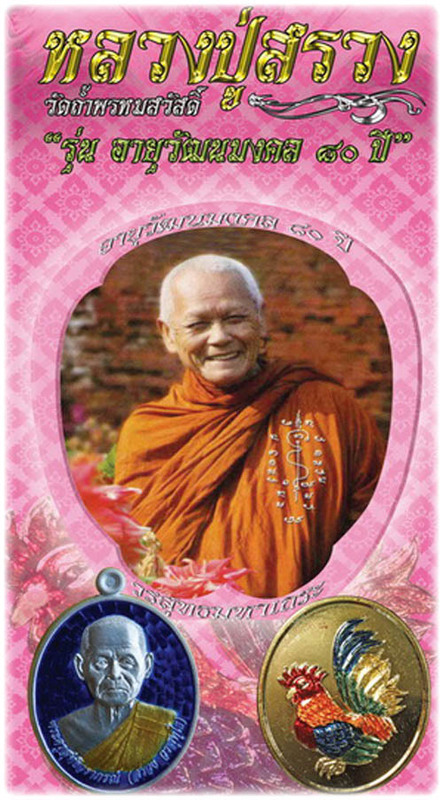 Luang Phu Tuad sits around the four cardinal points of his yantra. 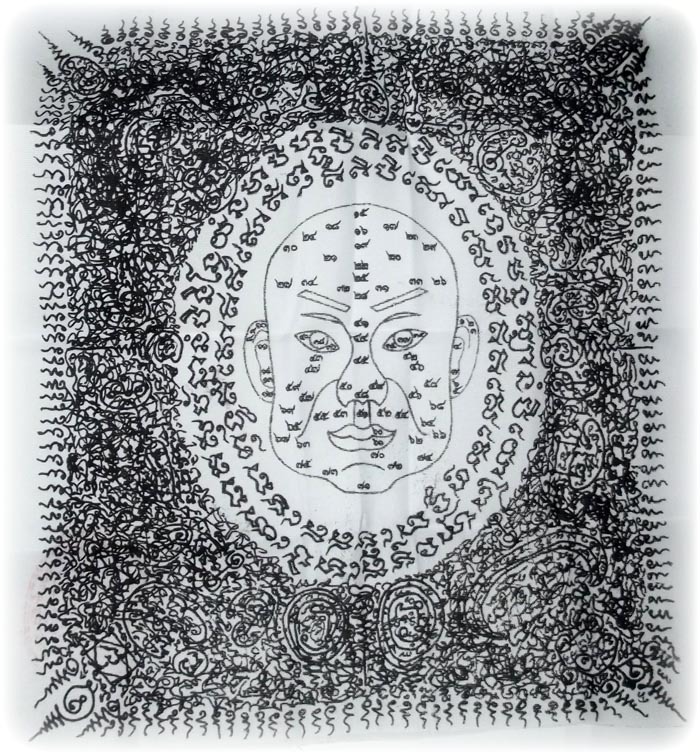 This yantra contains the Hua Jai Kata Potisat of Luang Phu Tuad, which goes as follows: Na Mo Potisadto Aakandtimaaya Idti Pakawaa. Luang Por Tan Jao Khun Juea empowered the coins and yantra cloths with invocations of the spells for the ‘Five Mountains’ and ‘Three Palaces of Prosperity’. These invocations, when combined, complete the formula for successes in all professional, social, and speculative ventures. The empowerment was completed with the wicha Mongkut Pra Putta Jao (‘Buddha’s Crown’). The coins were made in two different sacred metals: (1) nuea tong chompoo (a sacred copper alloy with pink gold), and (2) nuea nava loha (nine sacred artifact metals). Both versions come with either a red, or black yantra cloth. 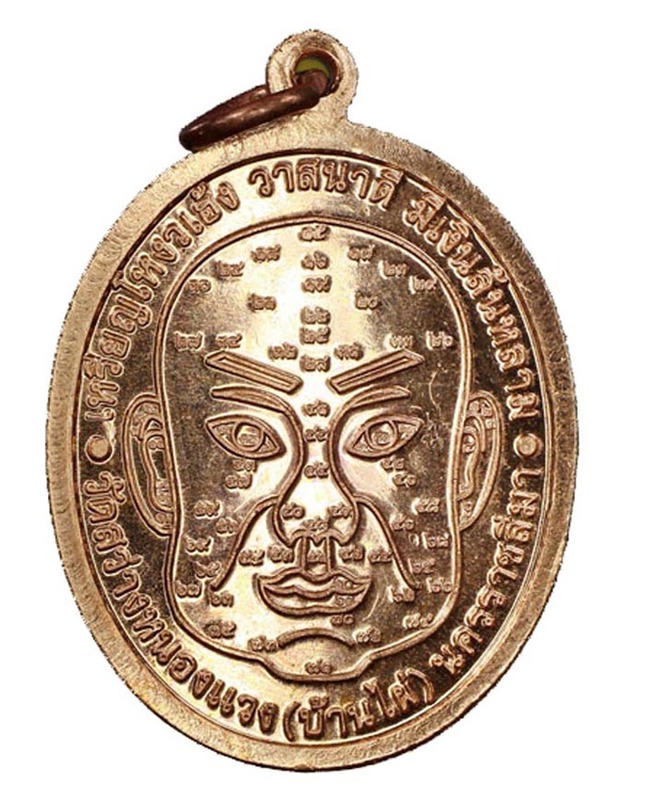 The front face of the amulet has the image of Luang Por Tan Jao Khun Juea, and the rear face features the face of the Ngoe Heng deity. 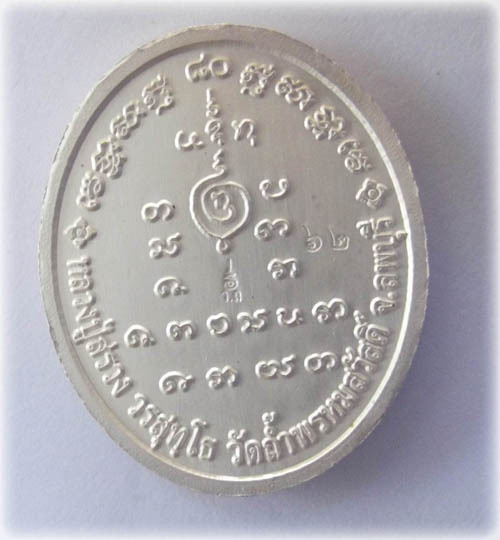 The pha yant and Ngoe Heng coin can be worn or carried in the purse or pocket, or kept on the office table or cash till. The coin and cloth work best when used in combination, you can even wrap the coin in the cloth if wished. There are some ritual bucha practices necessary for self empowerment and activation of the wicha with your horoscope. The pha yant is 21 cm high x 19 cm wide; color can vary (red or black). 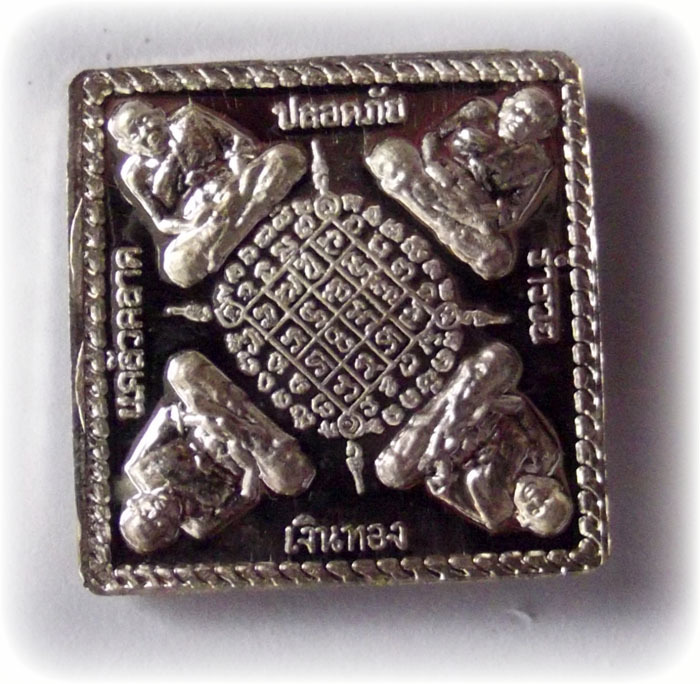 The pha yant (cloth) can be used to wrap the coin, or as a double flanked wicha to keep at home on the wall, and carry the coin, to ensure prosperity in the home and out at work. Light five sticks of incense and make three prostrations to the Triple Gem (Buddha, Dhamma,Sangha), one’s guru, and parents. 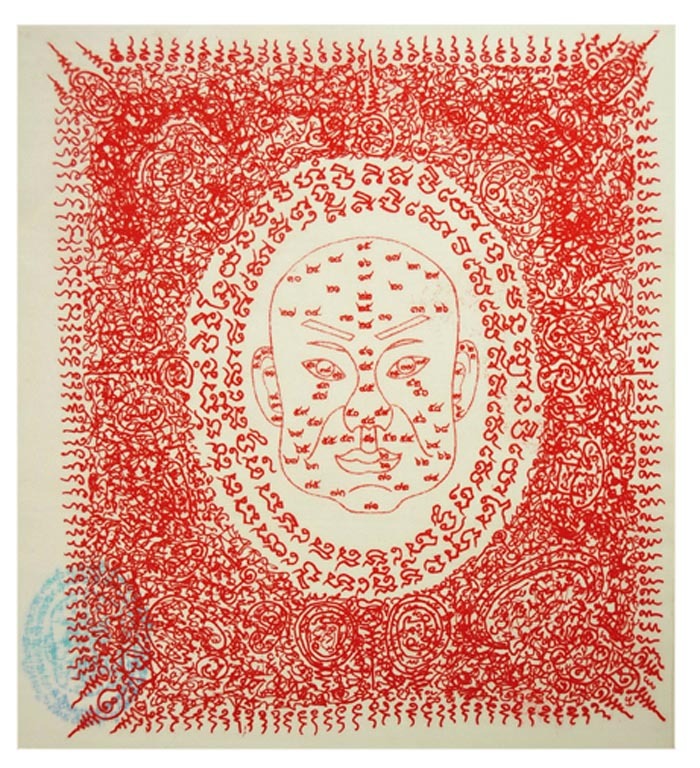 Spread the yantra cloth out flat with your hand, and take a black lead pencil, and trace circles around the number of your current age that is inscribed upon Ngoe Heng’s face (numbers are in Thai). Or, you can trace as many circles as the years of your age around Ngoe Heng’s face. Hold your heart and mind still and focused whilst doing this. Namo Tassa Bhagavato Arahato Sammaa Sam Buddhassa. Next, focus your mind and pray: “I (say your name and surname), who was born on (birthday date and year), ask to imprint my horoscope and line of fate within this yantra, and ask for blessings through the powerful attainments and merits of the Buddha, Dhamma and all the enlightened arahants, guru teachers, and the lineage of Luang Phu Taw, Luang Phu Noi, and Luang Phor Juea. Please help my woeng heng to be transformed into Ngoe Heng of the lucky and wealthy mystic dragon throne. May all my professional ventures be successful and prosperous, and all my undertakings bring great Fruits. May the power of Ngoe Heng pull the lucky forces of all directions of the universe to orbit around my star sign and focus lucky blessings of wealth and prosperity”. The wicha Ngoe Heng is said to contain five mountains of blessings and three palaces of fulfillled wishes. The ‘Nose Mountain’ brings the blessing of prosperity and wealthy treasures to a happy family and secure household. The ‘Palace of Earth’ brings prosperous business and success in all ventures.